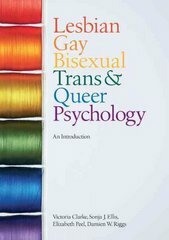 Lesbian, Gay, Bisexual, Trans and Queer Psychology 1 Edition This exciting and engaging textbook introduces students to the psychology of lesbian, gay, bisexual, trans and queer lives and experiences. It covers a broad range of topics including diversity, prejudice, health, relationships, parenting and lifespan experiences from youth to old age. The book includes 'key researcher' boxes, which outline the contributions of significant individuals and their motivations for conducting their research in their own words. Key issues and debates are discussed throughout the book, and questions for discussion and classroom exercises help students reflect critically and apply their learning. There are extensive links to further resources and information, as well as 'gaps and absences' sections, indicating major limitations of research in a particular area. This is the essential textbook for anyone studying LGBTQ Psychology, Psychology of Sexuality or related courses. It is also a useful supplement to courses on Gender and Developmental Psychology.